The annual session of a China-South Africa Vocational Education Cooperative Alliance was held in Changzhou city, Jiangsu province on Jan 22. The session saw a cooperative agreement inked between the two countries, focusing on the training of South African students and teachers in China. An official website and WeChat account was launched on the sidelines, along with the unveiling of a research center on industrial cooperation and vocational education between China and South Africa. 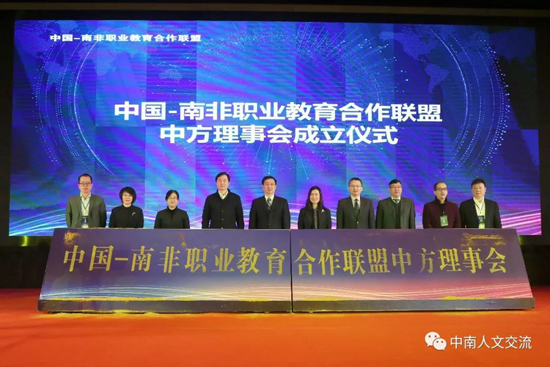 The some 180 attendees included officials from the Ministry of Education and the Jiangsu Provincial Department of Education, as well as high school and enterprise representatives, and experts in fields of educational openness, industry-education integration, and African issues. Initiated in Jan 30, 2018, the alliance was a joint effort among 58 government sectors, universities and colleges, and enterprises. This was a practical move for the two countries' closer educational connections in recent years, such as the first group of 200 South African students embarking on their study journey to China in 2017 and the African country planning to send more high school students to enhance their education in China in 2019.